Open Air Lifestyles, LLC not only creates unique, high-end outdoor patio furniture, we also create a mood or feeling to put that finishing touch and feel to your outdoor space. Wicker patio furniture enables warmth and comfort, teak furniture, a feeling of nature and cast aluminum or sling patio furniture feels strong and regal. We have taken the extra time to research and test each and every material we have chosen for our Collections. 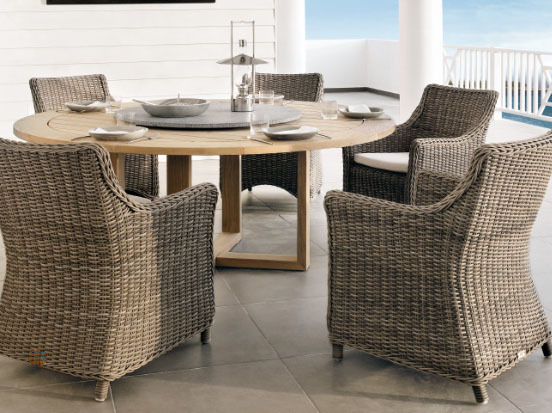 The Viro Brand all-weather wicker is by the far the industry leader in durability and high-end style. It has been chosen for years by the most reputable furniture manufacturers in the outdoor industry because of its tremendous reputation and reliability. We would accept nothing but the best material to ensure that our customers can have the confidence that our Collections will last them a lifetime. All the cushions we manufacturer for every Collection are the industries finest Sunbrella fabric. Sunbrella has boasted to be the best, most durable material available for stain resistance and long-term use that money can buy. Their wide selection of colors and patterns gives us the ability to change looks for each and every season, or when and what the market trend dictates. This season is fore-casted to be bright but neutral, patterned but not overdone. We always are incorporating new looks and colors to our line ups, giving our customers not just fantastic style but a feeling of luxury and romance in every Collection. Our cast aluminum patio furniture is constructed and die casted from virgin aluminum from Australia. There is absolutely no re-melting of any kind with our factory. High end style and pure materials, make our cast furniture some of the industries finest. The final touches are never forgotten, precision grinding, welding and 5-stage powder-coating and stainless steel hardware completes each and every piece of our furniture. Our factory is ISO certified and compliant, which ensures that each piece of cast aluminum furniture is inspected and approved before it is sold to our valued customers. We also use Sunbrella for all of our sling Collections, so not only are you getting Grade A aluminum construction, but the guarantee that we have not cut cost on the sling fabric. Finally, our Grade A Indonesian teak furniture holds its own in every sense of the category “Green”. Each set is hand carved, the utmost care taken to make sure you are receiving a man-made product from start to finish. Our factory is one of the leading producers of teak outdoor and indoor furniture since 1993 and you can tell by their craftsmanship, they take great pride in what they produce. Each design we submit is carefully engineered to our specifications so the final teak product is second to none. We are proud to be able to offer our customers exactly what we advertise. These Collections are also finished with full sets of Sunbrella fabric. Open Air Lifestyles, LLC is your full service outdoor patio furniture manufacturer/wholesaler and online retailer. We put our customer service and product quality first in everything we do. From outfitting a large commercial account or selling a family a simple dining set, each and every person is treated and serviced exactly the same. Our customer service relation department is available 24 hours a day to answer any and all of your concerns or questions, our warranty department fulfills each and every warranty claim within the time period of their purchase. It is more than just a job for us, it is a “lifestyle”, an Open Air Lifestyle. Our furniture appeals to each and every price point without compromising quality or durability and is suitable for a family gathering or a lavish party. 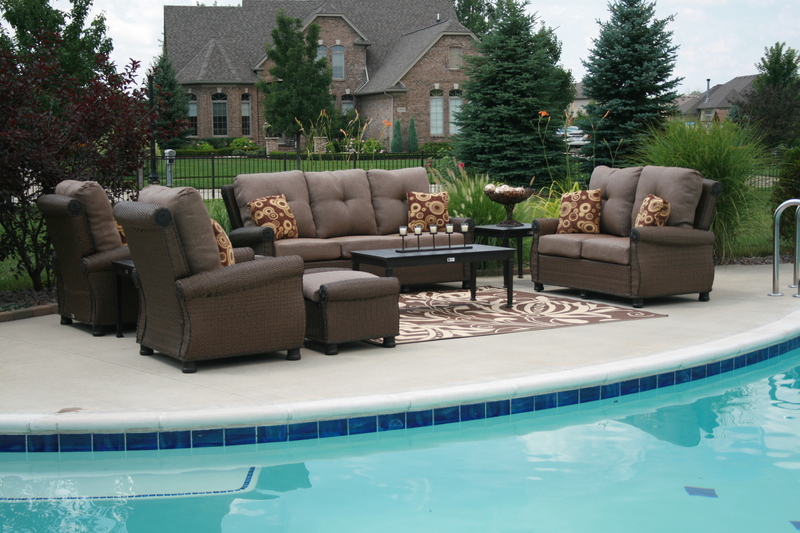 Our commitment to quality is your key to a beautiful outdoor living space and an exceptional purchasing experience. We not only sell furniture, we sell a lifestyle. Let us enchance your outdoor space with some of the most unique, affordable luxury outdoor patio furniture in the industry. « Is Outfitting Your Patio One Of Your New Years Resolutions?